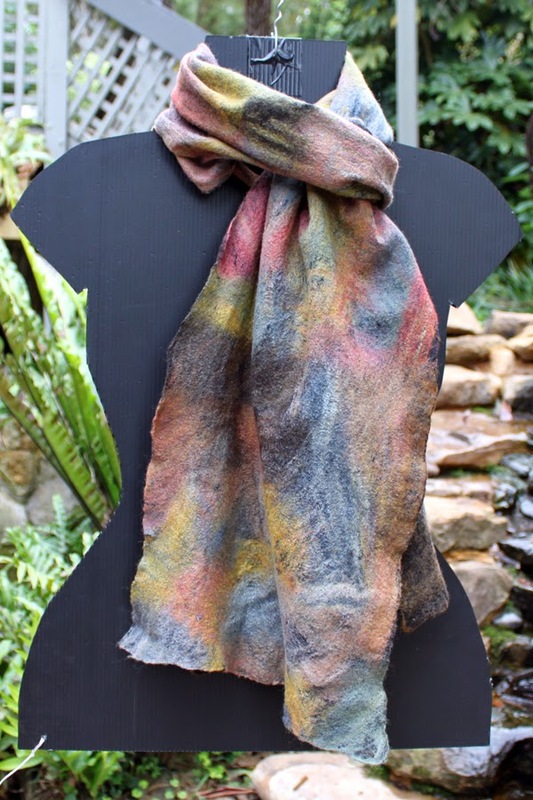 I’m growing rather tired of the ‘themed’ scarf festivals held at the Geelong Wool Museum …this year it is ‘home’ – what home means to us…Perhaps it will be my last contribution to the festival…and perhaps I may not even enter my contribution(s ), as I’m not happy with them. How to sum up this ‘subject’ of home in a scarf representation when it has taken most of my adult life of exploring to discover what home is, and where it is…I started where I left off with this inquiring into home and belonging. A woman with roots in air like the banyan…deracinated…my roots never seemed to have taken in the new country where we were called ‘New Australians’. Sometimes the customs of your adopted country can move you in unexpected ways. For the Australian Aborigine the land is not separate from the soul and to gaze upon country is like beholding the self. But the person needs to travel through it, naming it, constantly making new stories. Yes, I have ‘appropriated’ this belief of the Songline – with a twist – seeing the body as landscape, as geography, in which to settle. After traveling back and forth between the new and old country, gathering and writing stories about my kin and those not of my kin became a way to gaze upon my-self and behold my country. Now middle aged, I’m settled in the skin I’m in. So how to ‘represent’ ... as writing and stories are significant I decided I would tell this little story about ‘home’, what it’s taken to realize where home is. Also I like to trace the roots of words (etymology), and words seem to have formed my roots to things, as indeed have stories. There are lines from a Talking Heads song ‘This must be the place’, yes I’m already there; as well as words from John O’Donohue’s book Eternal Echoes, which has as its theme our hunger to belong. I also wanted to incorporate some fabric from that dressing gown that my mother wore while she awaited my coming into the world, and which was made by my grandmother. I have already used the fabric in my ‘story cloth’; later I incorporated most of the skirt in an upcycled dress, but I thought to send some of the threads and shreds of the fabric on its own journey into the world, even if they end up in some landfill, somewhere, rather than hanging onto it as ‘precious’…torn bits were used as roots, but also to evoke my ‘songline’, stretching back to ancestors and creating my story. They also remind me of ‘veins’, arteries of the body, and arterial roads in a landscape …the ‘red on white’ – filled not unlike the pages of a notepad. I was told, most likely by my mother that it was bad manners to write in red ink and I so dislike teachers who scribble in red ink all over the pages of their students’ work – their ‘corrections’. I suppose I decided on red thread because of its association with blood, earth and passion and because it is ‘impolite’ (I admit to a rebellious streak) – and when the red from the dressing gown fabric bled into the white wool I wasn’t concerned about the stains (though surprised as the fabric is so old). Those crimson sari fabric scraps from which I formed a tree, also bled...interesting how you can 'know' but still intuition prompts you to use them regardless. These scarves had a becoming of their own. I’d intended to euca dye them but found on ‘writing’ upon them that they were already ‘full’ and busy – ‘finished’. With the first scarf, as I was learning to write in poly thread with my darning foot, the writing became rather like my own handwriting, which can start off large but then gets smaller the longer I write. The writing is continuous without a comma or full stop, as Cesaire, poet of Negritude showed me – language running away with itself like the marrons (runaway slaves). I’m sure for the ‘civilised’ the writing on the scarves will seem like babble. Perhaps a dyed euca leaf or two wouldn't go astray? They’re not the most beautiful scarves and perhaps these ‘themed’ exhibitions end up with lots of works that are meaningful, intrinsically personal, but not necessarily beautiful or sale-able ‘products’. Oh Joni...Wish that I could transport myself for just a moment so that I could see (and touch) your beautiful scarves in person. They are lovely, and the writing, both the script and the words, so very beautiful. The 'words'...they are true my dear friend.